High on taste (though not on colour/looks here)! 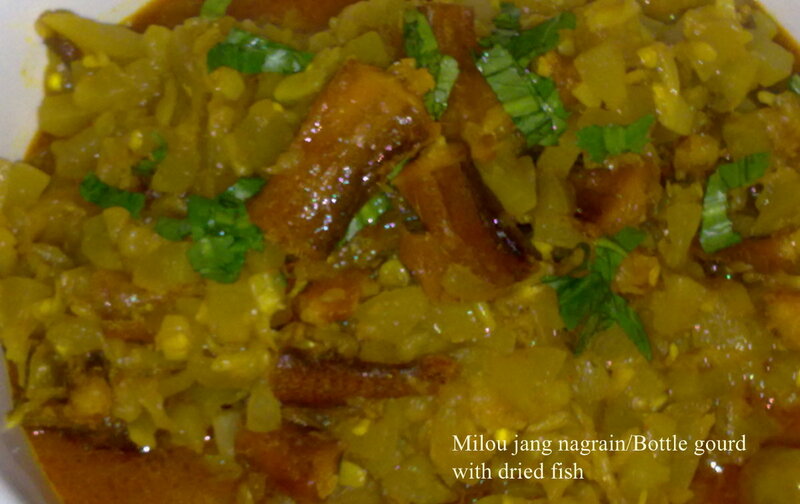 Dried fish is popular in our region and one of the most-cooked happens to be Bombay Duck/bummalo. It’s also known as Lotiya in our parts. The average length of the fish is about 25 cm. It’s an acquired taste and you either LOVE it or HATE it! There are several ways of preparing it. The curried form is common but we also make a delicious chutney by grilling these over hot coals/fire, then we pound them before adding chopped onions, herbs, roasted and chopped chillies. A bit of mustard oil is drizzled over the chutney and lightly mixed before it is served. Here’s a description from Wiki. The Bombay duck is not a duck but a lizardfish. It is native to the waters between Mumbai and Kutch in the Arabian Sea and also found in the Bay of Bengal in smaller numbers. The South China Sea is another area from where this variety of fish is found in large numbers. The fish is often dried and salted as the flesh does not have a distinctive taste of its own. After drying the odour of the fish is extremely powerful and it is usually transported in airtight containers. Fresh fish is usually fried and served as a starter. In Mumbai, Konkan, and the western coastal areas of India, this dish is known as Bombil fry. Bombay duck is also made into curry with the addition of vegetables, it’s also mixed in khari or in dal. Potatoes, pumpkin, several varieties of gourd work very well in this type of curry. Usually I like having this with bottle gourd but today I cooked it with a not-so-fresh cucumber that had been languishing in the fridge. Well, at least I made good use of it. Wash the dried fish pieces in tepid water. This makes it easier to get rid of any grit or sand. Drain. Peel and cut the cucumber. Remove the seeds and chop into small pieces. Meanwhile heat a pan and pour the mustard oil in it. When it becomes hot, shallow fry the fish pieces in batches. There is no need to add salt as the fish is salty. I don’t mix the turmeric powder either preferring to sprinkle it over the fish during the frying process. Since there’s some moisture left from washing the fish, the turmeric does not burn. They’ll soon turn golden brown. Remove and drain on kitchen paper. In the same oil, fry the onions till they change colour. Then add the rest of the spices. Fry for a few minutes then add the vegetable. The potatoes can go in later as they are boiled. Keep cooking till the oil separates. When the veggies are nearly done and the curry starts to look cooked, add some hot water. The veggies must not be totally submerged. Let it cook till almost done, then add the fried fish pieces. Cook for another five minutes, stir once or twice. Remove from the fire and garnish with chopped herbs. In my case I used serrated coriander. This curry goes best with steaming hot rice. With dal and other accompaniments, this will be enough for three to four people. 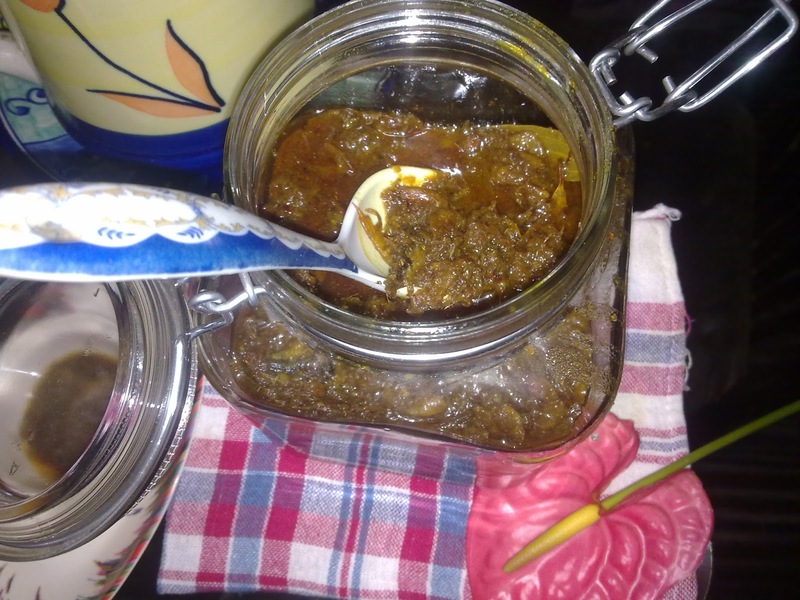 I like to add chopped pieces of Bombay duck to fermented fish pickle along with dried shrimp. A post I had done earlier on the same is here. The good thing about this type of curry is that you can team up a wide variety of vegetables to go with the fish. Potato and eggplant is another delicious combination. Thank you for stopping by today. Blending Flavours is on Facebook. I hope you visit and Like my page!